Sexual selection in ungulates has been studied for a long time from the male point of view. However, scarce evidences of female mate choice (the inter-sexual selection) can be found behind male fight in well known populations and there is an increasing number of studies on this topic. Female can select male for indirect benefit (“good genes” hypothesis) or for direct benefit (“harassment avoidance” hypothesis) through different process independent of the benefit obtained. Inter-sexual selection can be coincidental if natural female behaviors induce a bias in male mating opportunities (e.g. through habitat selection, anti-predator aggregations), can be an indirect mate choice if female behaviors increase competition among males (e.g. by inducing fights) or can be a direct mate choice if they use criteria to select their mate (e.g. male antler size, but the level of harassment in a group could also be such a criterion). Females have to use a sampling tactic in this last case in order to evaluate a criterion. Reindeer mating system is based on a fission-fusion group dynamic system, groups often split and mix. In addition, male dominance is not stable. Therefore, daily group compositions are not able to record precisely the among groups trajectory of females and, more important, are not able to distinguish whether a female change between two group is active (=voluntary) or passive (=following the group dynamic). 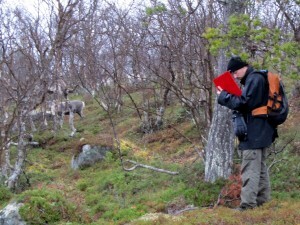 Using GPS data, I will establish the dynamic of groups during the mating season of a reindeer population, then I will investigate the active movement of females among groups as an indicator of their selection behavior. We will be studying a well known reindeer population from the Kutuharju Field Reindeer Research Station in Kaamanen, Finland (69°N, 27°E), a well know enclosed semi-domestic population. Each individual in this population will be equipped with a Tellus GPS collar which includes an activity sensor. All of them are synchronized in order to obtain the real spatial distribution of individuals in the population at a precise frequency. Groups’ definition and composition will be obtained by spatial analyses. 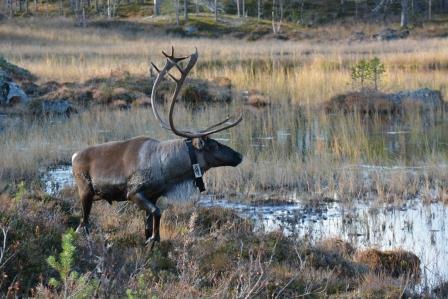 The objective of my PhD is to investigate whether reindeer female active movements among groups are sampling tactic and whether leaving a group is a sign of mate-choice preference using telemetry data. Develop the methodology to record group dynamic from GPS data in a fully equipped population. Develop indices of group harassment level and estrous detection from activity sensors. Determine whether females are sampling their mates during the mating season. Identify the sampling tactic by testing if the “good genes” hypothesis or the “harassment avoidance” hypothesis is able to explain females’ movements during the mating season. G. Body, O Holand, R.B. Weladji (2011) Linking group size to group dynamic: an exploratory analysis using GPS data. 1st Joint Congress on Evolutionary Biology. July 6-10th, 2012, Ottawa, Ontario, Canada (Page 94, oral presentation). G. Body, O Holand, R.B. Weladji (2011) L’apport de la technologie GPS au suivi de la dynamique de fusion-fission des groupes: exemple du rut du renne Rangifer tarandus. Colloque annuel du Centre de la Science de la Biodiversité du Québec, 8-9 December, 2011, Montréal, Québec, Canada (Page 30, oral presentation).